​Shirley Nelson is a published author. She is the editor and distributor of San’s Sacred Circle, a community-based newsletter for inspiration and spiritual growth. She leads women spiritual support groups and facilitates retreats and workshops for churches and other organizations in the Cleveland, Ohio region and nationally. She holds a bachelor's degree in psychology from Capital University and is a certified life skills coach, Reiki practitioner, and lay minister. 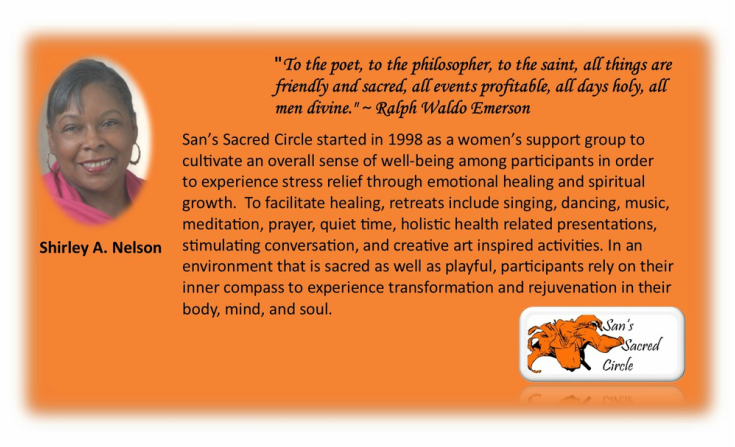 Welcome to San’s Sacred Circle, offering spiritual retreats for body, mind, and soul stress relief as well as an online newsletter featuring reflections on stress relief, emotional healing, self-acceptance, forgiveness, prayer, meditation, self-compassion and other spiritual practices. For more information Email sanscircle@gmail.com. One of the most challenging aspects in life is the capacity to be kind to ourselves. It’s like carrying a big stick around beating ourselves up. We say things that are self-defeating; we question and analyze situations over and over again; and we judge ourselves as bad, stupid, or crazy. Life is short and at some point you have to learn how to be your own best friend. 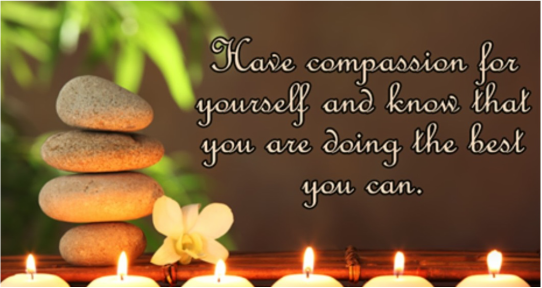 Self-compassion means you are kind and understanding toward yourself in instances of pain or failure, rather than being harshly self-critical. Self-compassion provides a stable sense of self-worth that does not fluctuate over time and it is not contingent upon looking a certain way or competing with others. We live in a society that regularly sends us messages to strive for more, work even harder, and aim to be the best! We’re so busy marching to the beat of this drum that we don’t have time to stop and think whether or not it’s what we really want. Nothing’s wrong with being busy if it’s working for you. But you might not really know until you ask yourself a few questions such as: Am I really interested in how I spend my time? Am I fully engaged, or am I simply running as fast as I can trying to keep up with life? Am I treating myself with compassion? ​Although you may be successful, your happiness will always hinge on having whatever it is you have strived to achieve. If you ever lose it, you lose yourself along with it. This could be a job, a relationship, things you have acquired along the way, a particular lifestyle, etc. etc. However, research studies reveal that our society’s emphasis on achievement and self-esteem lies at the heart of much unnecessary and even counterproductive suffering. Self-compassion can be learned. It is a practice that can help us all become less self-critical and perhaps even achieve more and give more. The three elements of self-compassion are: Self-kindness, Common Humanity, and Mindfulness. only one who hears them, can actually be deadly. Instead of waiting for others to offer a gentle word, or two, give to yourself. When you get used to hearing the voice within you speaking in a kind and compassionate tone, you will undoubtedly attract others who do the same, as nothing less will be acceptable. Suffering is something that we all share, so to suffer is to be human—no one gets in and out of here without a dose of it in some form or fashion. Childbirth is one of the most sacred phenomenon's that human’s experience, yet there is much suffering. You are not alone because you suffer and when you have those feelings that you’re the only one going through something, you suffer even more because you feel isolated. Let it go. It’s time to move on. You’re not the only one dealing with this. It’s all part of being human. It’s our common dilemma. Lastly, you can move towards a balanced approach to life by being more mindful. By observing your negative thoughts and emotions with openness and clarity, you become more aware and more mindful. So next time you’re feeling a little out of sorts, Stop, Look, and Listen. Instead of beating yourself up when things go bump in the night, give yourself some love and compassion. You deserve it! Click here for a print copy of this article in the September newsletter and to learn more about self-compassion.